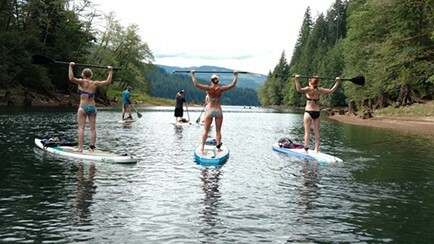 Michelle Doty is our Group Paddle-Fit Instructor here at NW SUP & Fitness. Michelle is a board certified personal trainer thru NASM and has many years of experience with fitness program applications, and of course Stand Up Paddle Boarding! 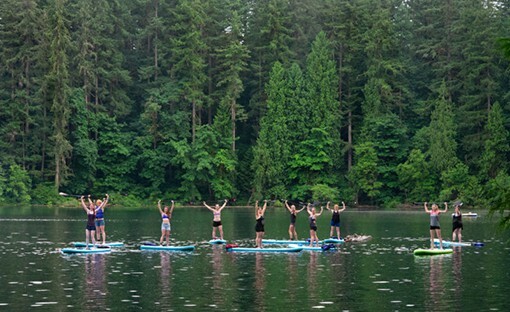 Paddle Boarding can be a great full body workout all on its own, but coupled with Michelle’s very unique programming that combines the fun & fit aspects of SUP with a professional fitness routine, you can take your fitness to the next level! No matter where you’re at on your personal fitness journey, this is the workout for you. Michelle will guide you thru every step (and paddle) of the workout, and model multiple modifications to keep you moving thru the workout routine without feeling overwhelmed or risking injury. Come join us on the water and I guarantee you will have fun, and get an amazing workout doing it. Our Paddle-Fit fleet consists of top of the line Red Paddle Co inflatable paddle boards, giving the highest quality ride & stability possible and maximizing the fun factor. We challenge you to “Think outside the Gym” and strive for a sustainable & rewarding fitness lifestyle. We love what we do, we know you will too! Suitable for all fitness and paddling skill levels. Starting at the One Lane Bridge, the calm waters leading out of Lake Merwin eventually end up at the gorgeous Canyon Creek waterfalls. There are plenty of shallow waters to practice paddling & balancing on your SUP board. 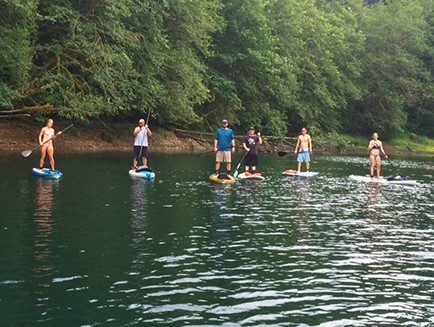 This is the perfect beginner’s location to learn the basics of SUP! Suitable for all fitness and paddling skill levels. Starting at the One Lane Bridge, the calm waters leading out of Lake Merwin eventually end up at the gorgeous Canyon Creek waterfalls. There are plenty of shallow waters to practice paddling & balancing on your SUP board. This is the perfect beginner’s location to learn the basics of SUP. Bring your Spouse or a friend and learn how to incorporate SUP into your fitness lifestyle! 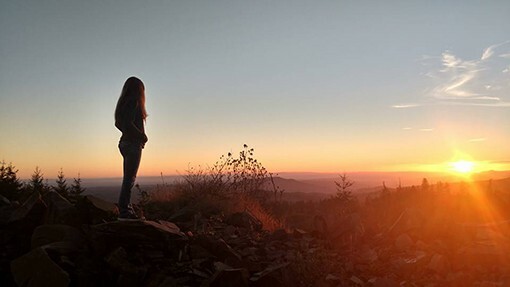 By far one of our favorite hikes in Clark County Washington, the Bells Mountain Trail is 7.7 miles if using a Shuttle, or roughly 16 miles if completed as an Out & Back. Very steep incline & declines with an elevation gain of over 3,300 feet, this trail is definitely for Women with a intermediate to advanced fitness level. About midway on the trail is hands down the best view of Mt St Helens you’ll ever see from this distance! Meet us on the Mountain and test your fitness limits on the Toutle Trail. 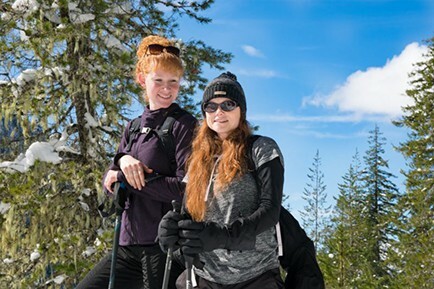 This is an aggressive 6 mile snowshoe trek with steep inclines & declines and deep powder, this Women’s Group Event is for women in the Intermediate to Advanced Fitness Levels. 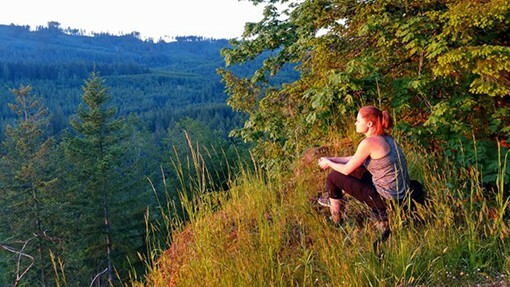 Starting at the Kalama Horse Camp, this trail crosses the Kalama River and heads up a steep incline and then follows along the top of the canyon. This Women’s Group Event is for anyone in reasonable physical condition that is capable of a long hike. Looping around the the long side of Merrill Lake, this is the perfect trail for beginners although all fitness levels are sure to enjoy the trail. 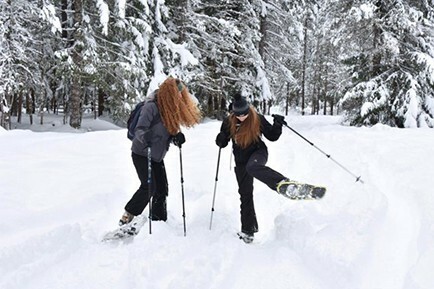 Massive old growth trees, spectacular views of the Lake, and interpretive signs along the way make this one of the most enjoyable snowshoeing trails in the North West!